I have a few personal favorite models... I guess that is to be expected, right? One of them is the 1927 Barrel. It was introduced in 1927 and produced through 1930. The Barrel came in green and white gold and gold filled originally and then in yellow gold / gold fill later on. 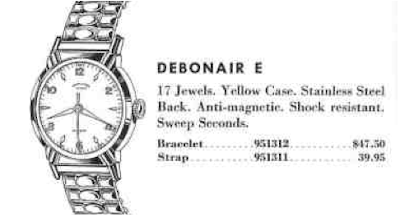 The models come as a Barrel Plain or Barrel Engraved depending upon the design of the bezel. The center case in both models is engraved. Dials are predominantly luminous although I've seen a few black enamel dials - but they are quite rare. I have wanted a white example for a long time and I always seem to wind up on the losing side of eBay auctions. Of course, Barrels in great condition are very desirable and I'm not the only one out there who likes them. Last month I purchased a white Barrel Plain that apparently no one else wanted, as I got it for $55. As you can see in the photo below, it was in need of some serious TLC. Well, it came to the right place. I overhauled the 17 jewel 987 movement, installed a new glass crystal, and had the dial and hands professionally refinished. With a new black lizard strap, this Barrel Plain is a welcome addition to the Hamilton fleet. Here's a nice shot of the engraving of the center case. 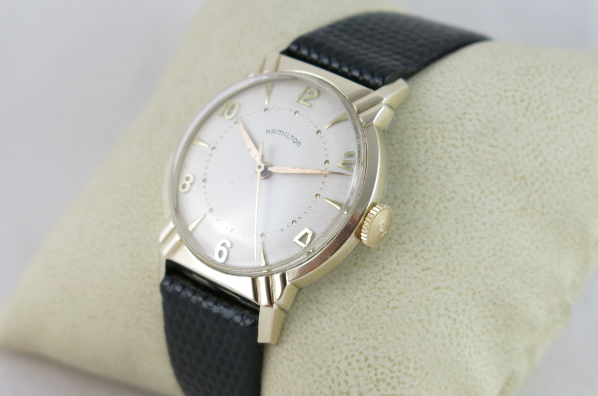 Restoring a vintage watch is very rewarding. 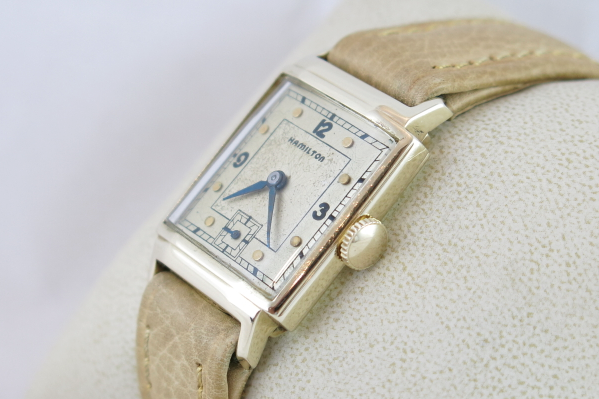 This was a very desirable watch when it was first purchased in the late 1920's. Obviously it had a long and arduous life but now it's ready for more wrist-time as a faithful timekeeper. The 1956 Essex is the second Hamilton model to feature the Essex name. 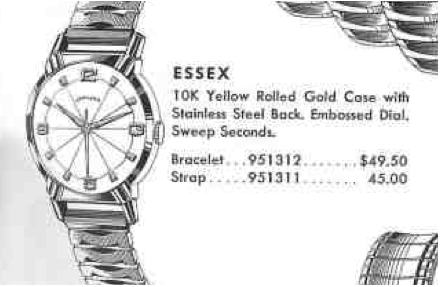 The original Essex came out in 1940. The 1956 Essex is considerably different though - it's a round watch while the original was rectangular. Although it was introduced in 1956 and produced for two years, the Essex looks an awful lot like an Illinois model from earlier in the 1950s... specifically the 1953 Model E which was renamed the Debonair E in 1954 and 1955. 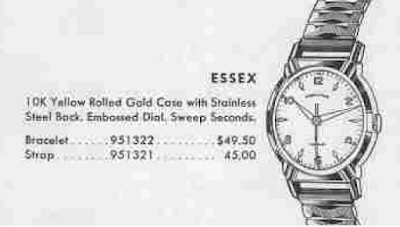 The Essex dial changed slightly in 1957 to have bolder numerals on the embossed (stamped) dial. 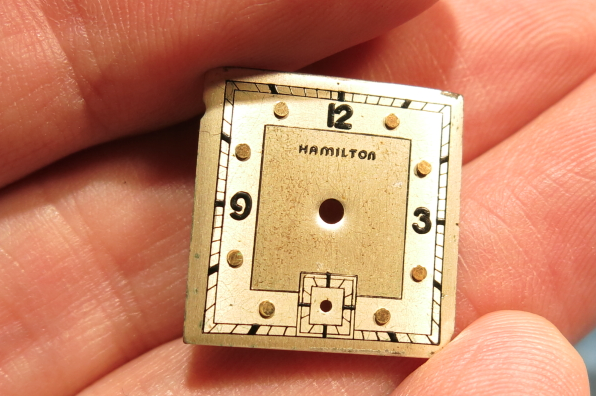 Behind the dial you should find a Hamilton 671 movement which is a Swiss-made movement produced by ETA and is equivalent to the 17 jewel 1080 movement. I recently purchased an Essex in a local shop and the second hand was missing and it was not running. Like the Sea-Scape I recently overhauled, this 671 gave me fits! 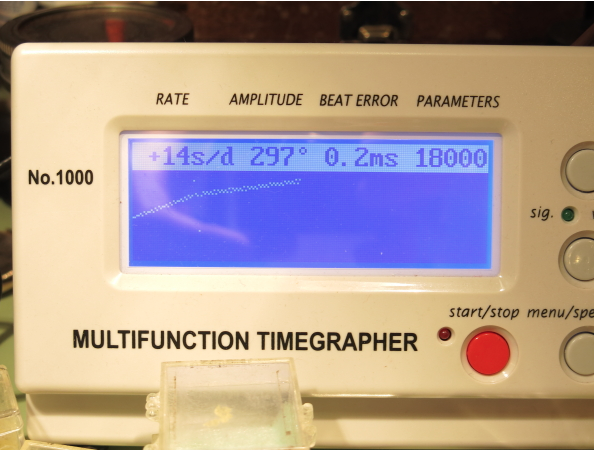 Then I realized the hairspring cleaner I was using must have been too dirty... as when I changed it everything went back to normal and ran as it should... go figure! So here's a couple of shots of my Essex. I replaced the Fourth Wheel - it's what drives the second hand, as the second hand bit (the part the second hand is supposed to attach to) was missing. I put a replacement hand on it and with a nice polish to the case and crystal, I'd say it looks great! 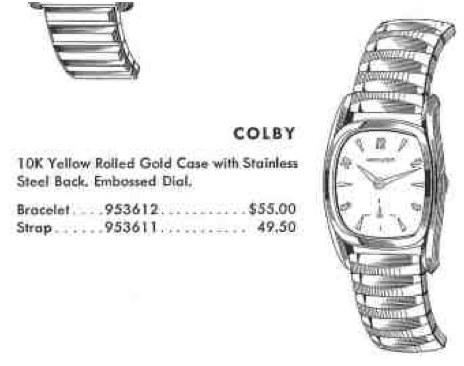 One thing that is interesting is the dial... it doesn't completely match the catalog image. It has a track of pearlized dots inside the markers and there's nothing written on the dial above the 6. I've never seen another Essex in the flesh before, other than the 1957 variety - so this is a very interesting mystery. 1940 was an interesting year in Hamilton's history. It introduced several new models that were only produced for one year. It also introduced the "new" 19 jewel 982M Medallion movement that would be used going forward for all solid gold models with 14/0 movements. 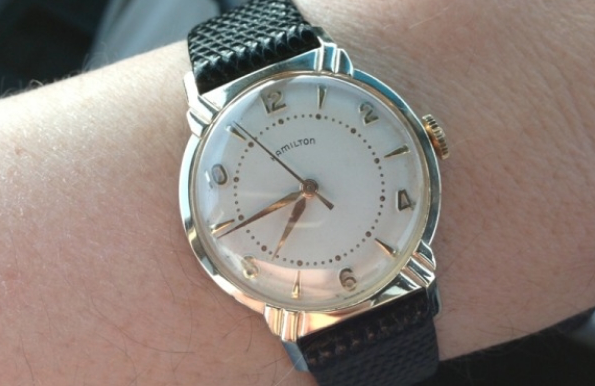 A great example of the 1940 "uniqueness" is the Hamilton Touraine. 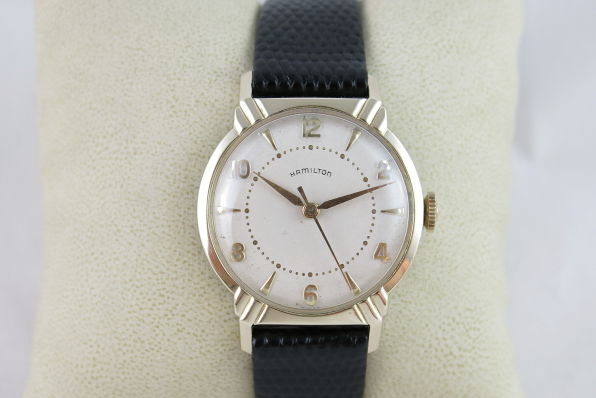 It's a very uncommon watch for sure and was only made for one year. 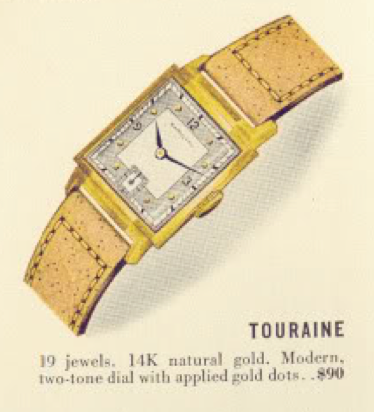 The Touraine came in a solid 14K yellow gold case. 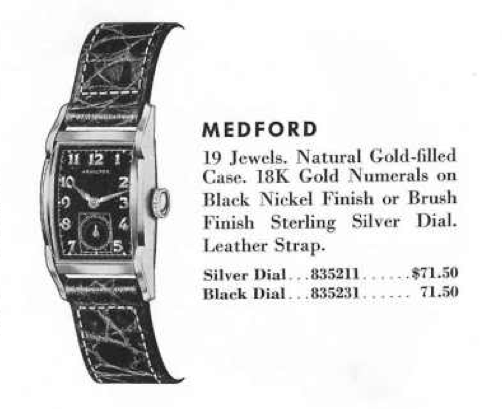 The two-tone sterling silver dial was accented with solid gold markers and black enamel numbers. The hands were black to match the enamel and are "alpha" style. 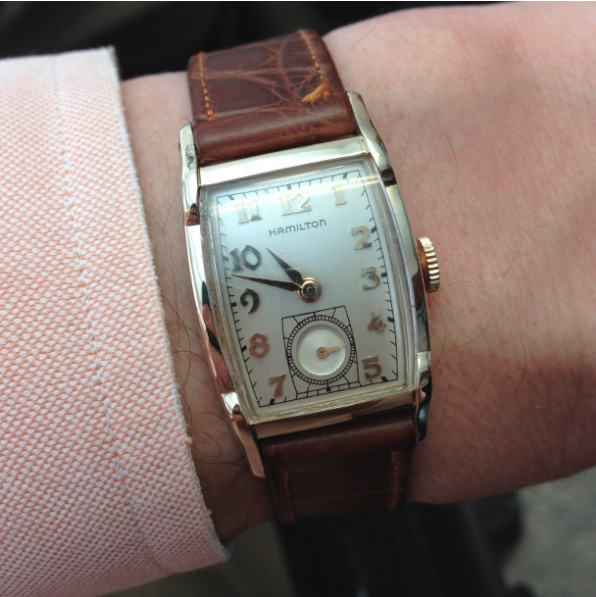 And of course, being solid gold, the Touraine came with the 19 jewel 982M movement. I recently overhauled a Touraine for a friend. I had never seen one before so it was a real treat to get my hands on it... a little nerve wracking too though - as I didn't want to mess up his Medallion movement. As received the watch was in pretty good shape overall but the crystal was pretty beat up. The hands are a little rusty too - not much I can do about that though - although they can be restored. The Medallion movement is pretty easy to identify... see the big gold medallion? The lettering is also gild so it's a little hard to make out what it all says. 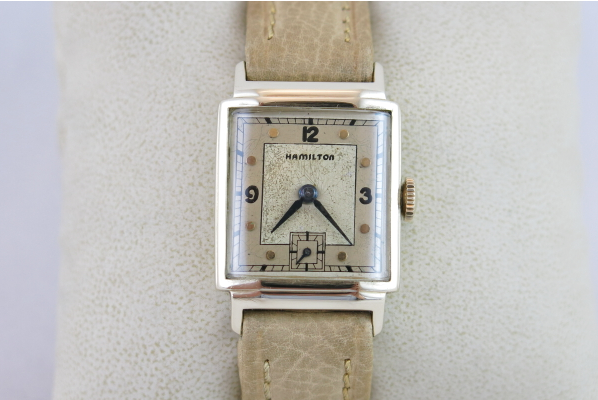 The serial number on this movement is M3578... so it was the 3578th movement Hamilton made in the 982M model line, confirming this is a 1940 movement. 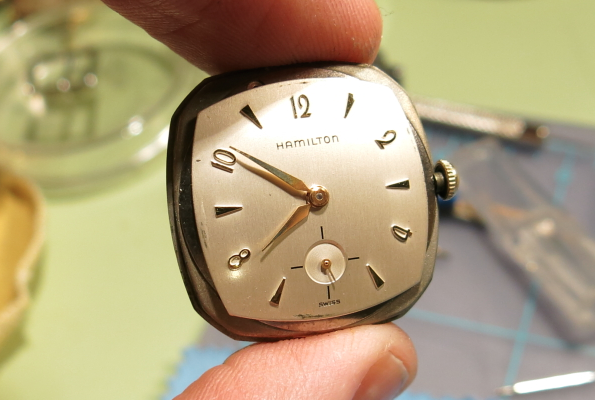 The dial is an older refinish and it looks okay, certainly not bad enough to warrant redoing. You can tell it's a refinish based on the printing but the little notch on the right side is a tell too. Flipping the dial over, you can see a couple of sets of figures scratched into the back... so this dial has seen a refinisher a couple of times in the past 70 years. The NOS glass crystal is pretty uniquely shaped. I had to work it with 600 grit sandpaper for about 30 minutes to get it to fit just right in the freshly polished case. 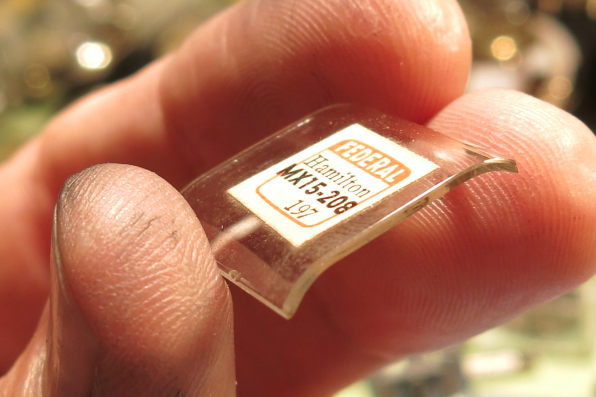 You don't want to be too rough with installing glass crystals - as they crack easily. You have to shape them so they fit easily in the bezel opening. The cleaning and reassembly of the watch went smoothly and it felt good to redeem myself after my Sea-Scape debacle the other evening. As you can see in the watch timer shot below, this watch is running just fine. 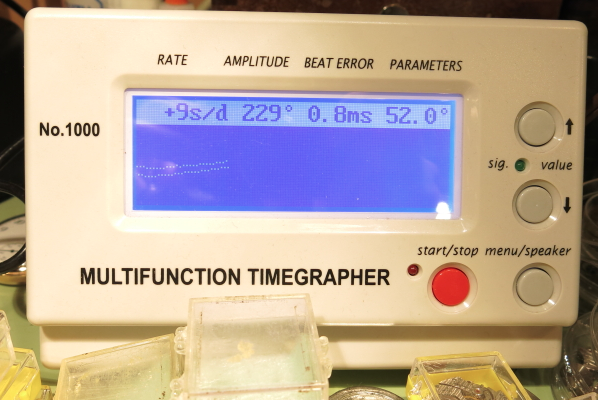 I adjusted it to run about 14 seconds fast per day, it will slow slightly as the mainspring unwinds. It has a nice white-alloy mainspring too, so there's plenty of amplitude (energy). The beat error is very low too, at 0.2ms. The beat error indicates how far the balance swings to one side versus to the other side. A beat error of zero would mean it swings equally in both directions. And here it is all polished up and running like it should. With a new crystal you can see that the dial doesn't look perfect but it's still not too bad. 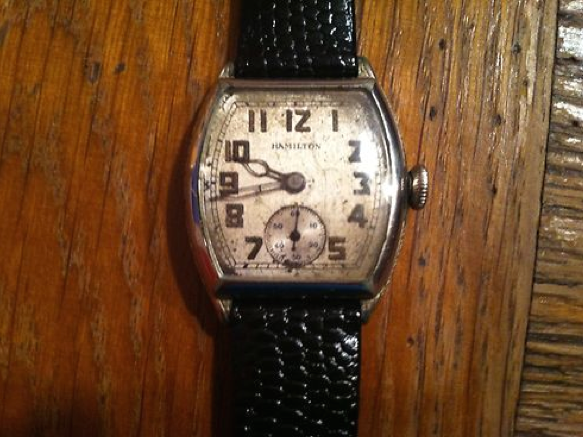 Looks like a very nice 73 year old watch to me. I'm sure my friend will be delighted with it. 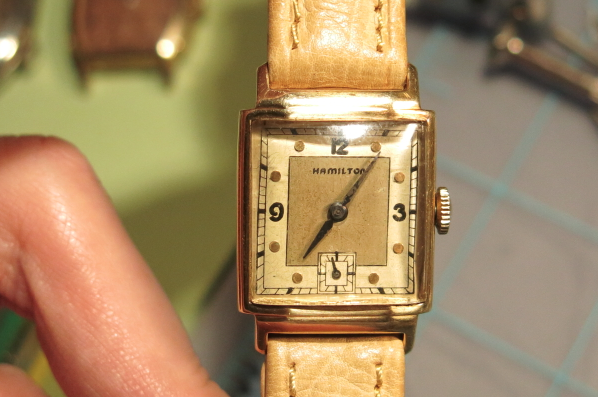 There must be at least 20 Hamilton watches named Sea-something and they came in all sorts of shapes and sizes and some even electric models. You could put together quite a nice watch collection just by collecting the various different Sea-somethings with all the varieties of dial colors as well. 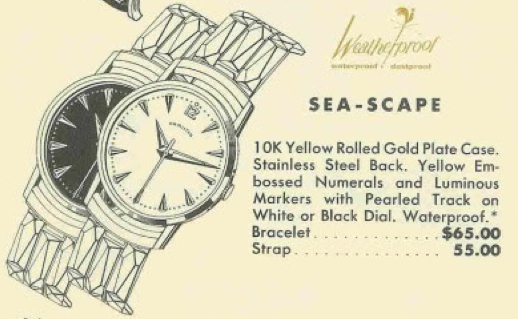 If you wanted to get started you could try the 1959 Sea Scape. Just getting started with this model would require getting the black and the white dialed versions. The Sea-Scape was produced for three years. There's also a Sea Scape II and a Sea Scape III to keep you on the hunt. The Sea-Scape came in a 10K rolled gold plate case. RGP cases don't have as much gold as gold filled and the RGP cases generally were used on the lower-tier of the Hamilton line up. 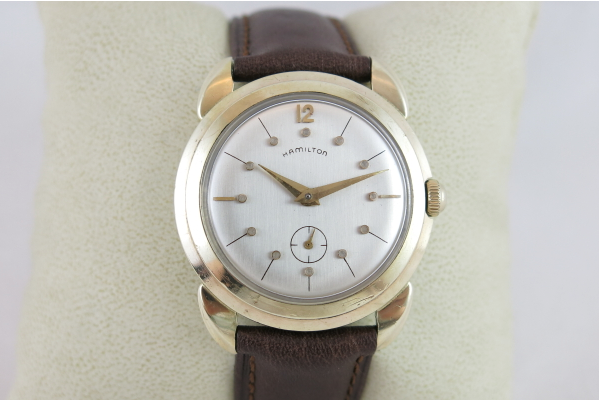 In order to keep a lower price point, the Sea Scape also uses a Swiss-made Hamilton 671 movement. This 17 jewel sweep second movement was made by ETA and is also known as the ETA 1080 - which is helpful to know if you need a part for it. I recently acquired a Sea-Scape project watch. I'd show you the overhaul but I'm a little embarrassed to say that I couldn't get it to run right. Yup that's right - sometimes a watch gets the best of me and this one really put me through the ringer. Here's a shot of the Sea-Scape as received. It was very "gunky" with a lot of crud in the nooks and crannies. 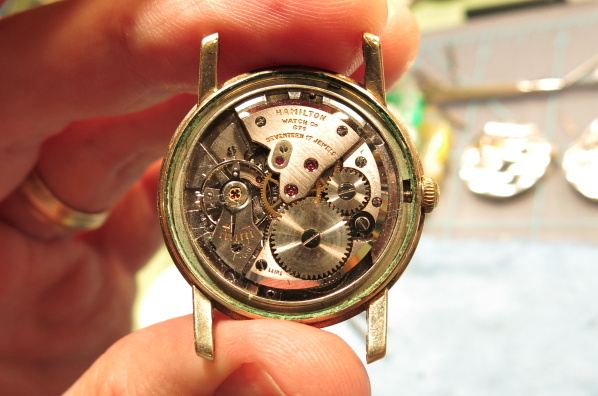 Here's a shot of the Hamilton 671 movement. 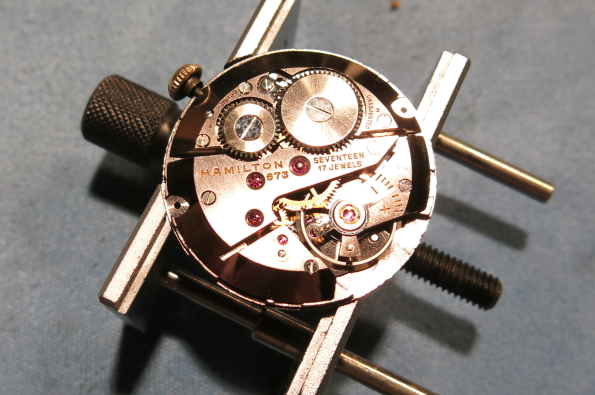 I completely disassembled it, cleaned it and oiled it but the hairspring is a little off center so it runs too fast. After fighting the darned thing for a few hours I threw in the towel. It had beaten me. I put it all back together and took an "after" photo so you'd see what it would look like all cleaned up with a fresh crystal. So what am I going to do now? Well, hairsprings are tricky business. 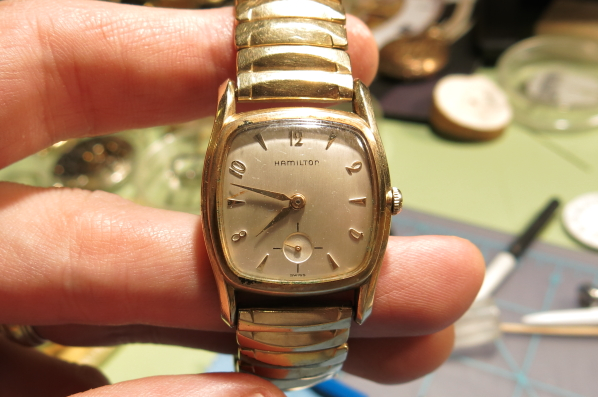 If you think reassembling a watch is intimidating, then reshaping hairsprings should be nothing short of magical. I'm just a hobbyist and I wouldn't dare call myself a watchmaker because watchmakers know how to work hairspring magic - and I don't. That means I have two options... find a donor movement or send this to a watchmaker. That's a pretty tough call because both are good options. But in this case, I think I will go with the latter - as I have about 10 movements in similar a situation (running but poorly) and it would be good to get them all back in proper running order. 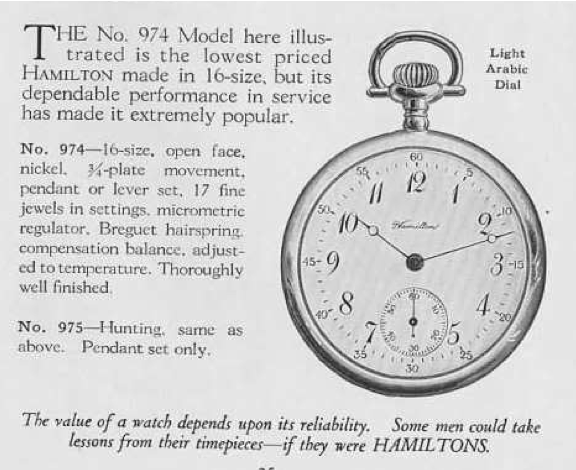 Hamilton made a variety of pocket watch movements after the turn of the last century. 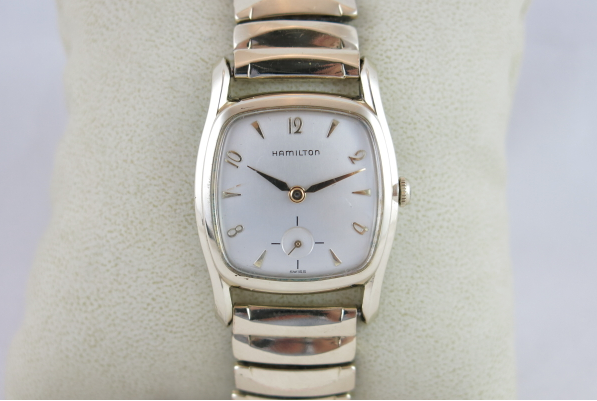 Sizes ranged from ladies 0-sizes up through 18-size, Hamilton's largest movements. 18 size movements eventually gave way to slightly smaller 16 size movements and one of the lower priced 17 jewel 16 size movements is the 974. 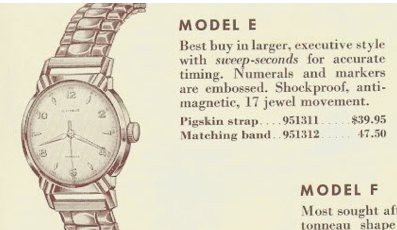 The 974 went in to "open faced" pocket watches while the 975 went into "hunter cased" watches. 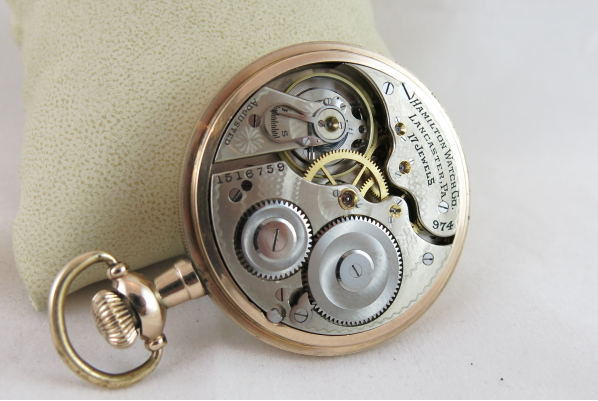 A hunter cased movement will have the seconds at a 3:00 position relative to the stem. It's sometimes called a "side winder" as the dial is rotated 90 degrees to keep the seconds at 6 position. 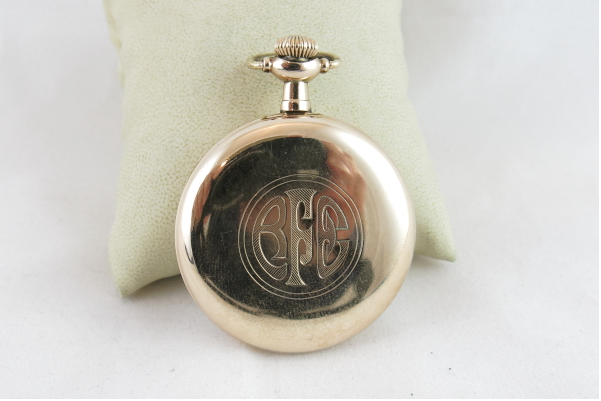 Here's a nice example of a 974 pocket watch with a serial number dating to about 1920. 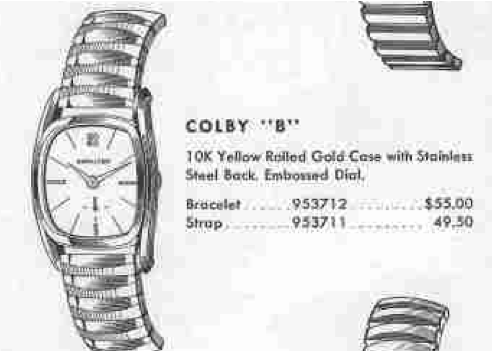 It looks quite similar to the catalog image, except the dial doesn't have the 5 - 60 outer register. It's a very nice looking watch and is a nice size too, measuring in at almost 50mm in diameter. The 974 is a typical-looking 3/4 plate movement. The regulator also has a micro regulator to move adjust the timing by means of turning a screw. This allows for very precise regulating of the hairspring. It's not uncommon to find some means of personalization engraved on the case back. 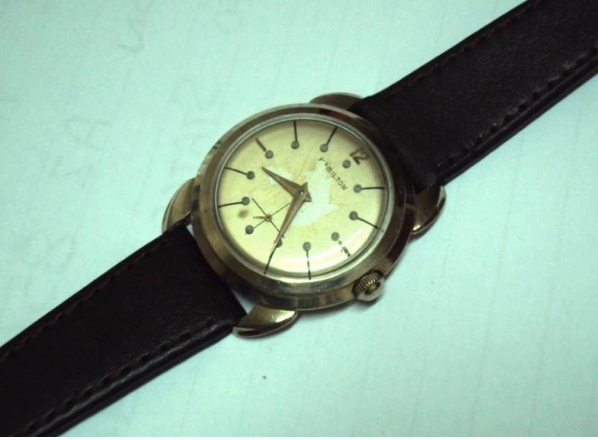 This watch also has a date engraved inside the case back. I'm sure this was a treasured watch for someone. The case is in excellent shape. The only gold loss is on the bow, where I presume a chain wore against it for decades. 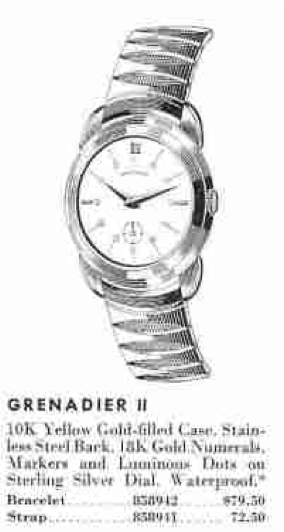 In 1955 Hamilton introduced the Grenadier II. They also happened to introduce the Grenadier the same year - which sort of makes you wonder why they had two Grenadier models at the same time. 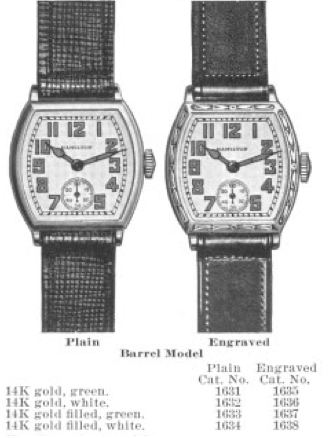 My guess is they shared the same case but the Grenadier has a sweep second movement while the Grenadier II has a sub-second movement. Both models were produced for three years. The Grendadier II comes in a 10K yellow gold filled case with a stainless steel back. Sometimes this case is described as a "flying saucer" and reminiscent of the 1950's sci-fi movies. 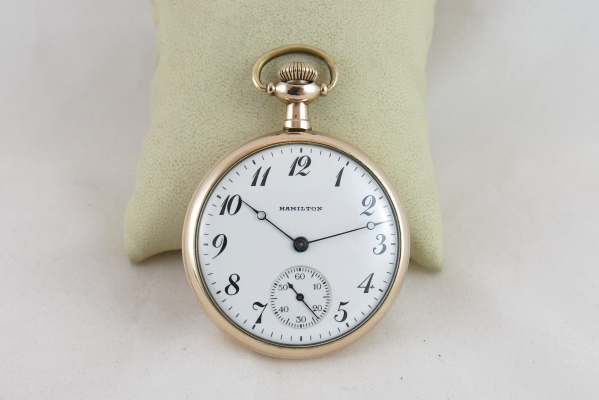 The silver dial features solid 18K gold numerals and luminous dots. 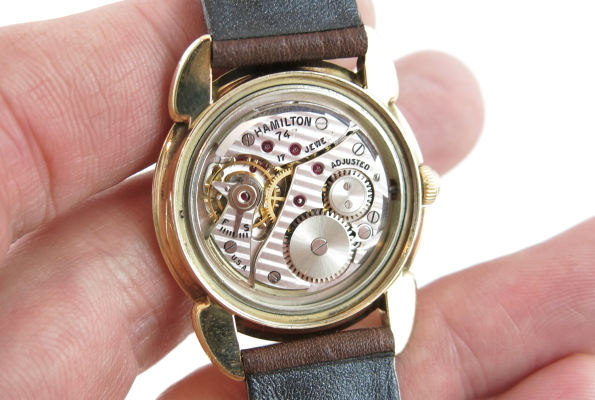 Under the "hood" you will find a 17 jewel, 8/0 sized Hamilton movement... either a 747 or a 730, depending on when the watch was produced. The 730 is virtually identical to the 747 except for shock jewels added to protect the balance staff. The hand style is called "dauphine" and they are solid. What's that you say? Why have solid hands but luminous dots? How could you tell the time in the dark without lume on the hands? Well, to explain, let me show you a recent restoration of a Grendadier II. As received the dial was incorrectly refinished at some point and the lacquer on the dial was flaking off in the center. 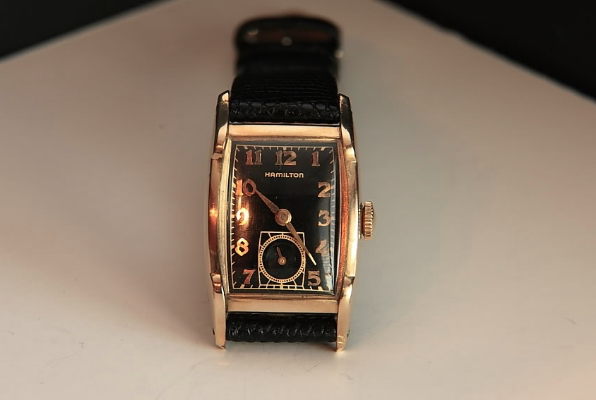 It turns out that the hands had radium under the hands so when they glowed they would illuminate the dial. The hands would be dark silhouettes on an illuminated dial. Radium emits alpha rays 24x7 for about 1600 years so after a while that takes its toll on the dial surface. Fortunately the watch case and crystal block alpha rays so the "danger" is minimal. But that's how the illumination of the dial occurred. If Radium concerns you, and it probably should, then be sure to have your house checked for radon gas - as Radium is naturally occurring in many places around the world and leaks out of the ground as radon and into your basement or crawlspace. This dial was toast though so it had to be redone. 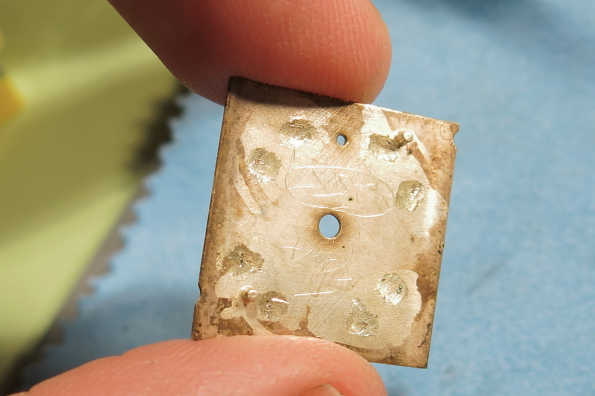 During the process I removed the radium in my ultrasonic and returned it to the earth from which it came. 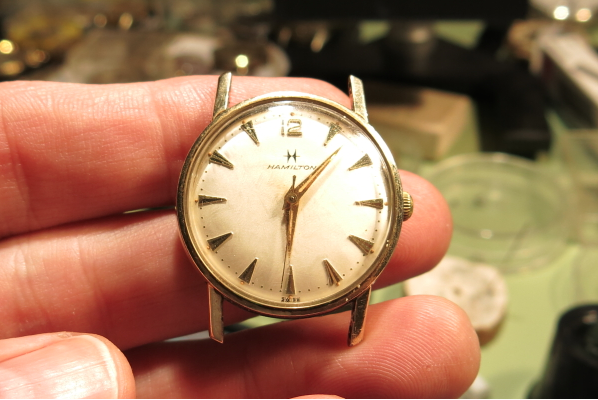 And here is the watch after having the dial professionally refinished by International Dial Co. They did an awesome job, as usual. One final bit of trivia is on the movement. If you look closely below, you may note an irregularity. No, it's not that one of the 7's in 747 is missing it's black enamel (although that's true). 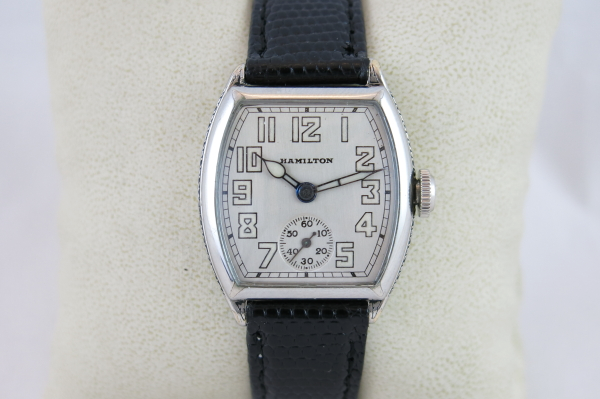 Around the mid-1950's Hamilton stopped putting serial numbers on their movements so this movement has no serial number where earlier 747's do have one (on the barrel bridge). Anyway, this Grenadier has been returned to "almost new" condition, but with only luminous dots. The best this watch can do now is allow you to find it in the dark. You won't be able to tell the time. 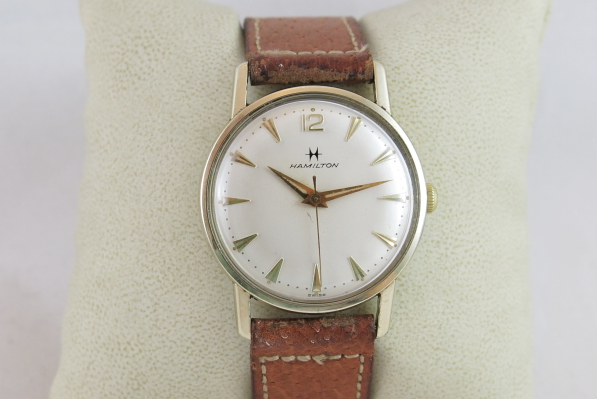 The Hamilton Medford was introduced in 1953 and only made for two years. 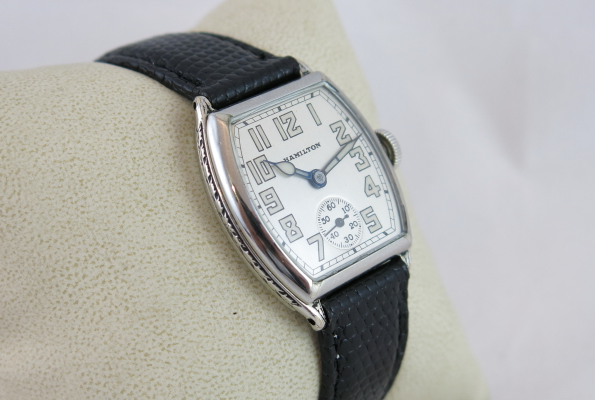 It's a classic tank-style, rectangular watch with a contoured case. 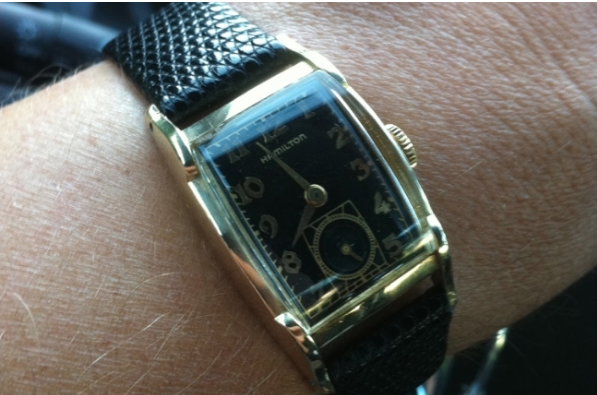 The case is 10K yellow gold filled and two dial options were available. Both dials are sterling silver with 18K gold numerals but you had your choice of a butler finish or a finish in black and gold. 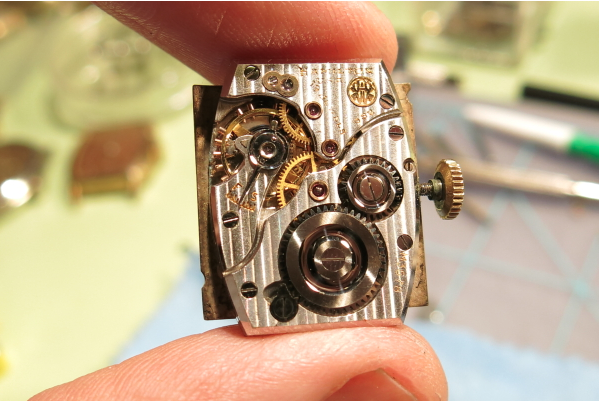 Under the dial is a 19 jewel, 12/0 sized 753 movement. Black dialed watches are typically less common than silver-colored (butler finished) dials and thus typically command a premium. I was lucky to find a black Medford very early in my collecting days and I've tried to land a silver Medford a number of times but I haven't landed one yet. I think it's a desirable model and usually draws a premium. Here's a white-dialed version of the Medford that a friend of mine recently gave me.